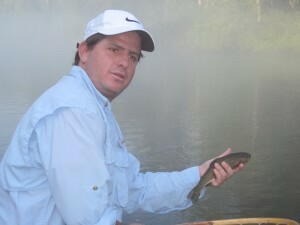 Last Friday we had a our seventeenth angler of the year catch their first fish on a fly with us. John Eustice resides in Mexico City and was vacationing with the family in our area. John caught his first Rainbow and first Brown Trout on a #14 RG/PT Cruiser. His sister-in-law, Christina, on the other hand is a very experienced fly angler and has guided a couple of seasons for Roaring Fork Anglers in Colorado. She starts medical school at the University of Michigan next week. 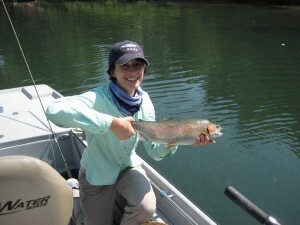 She caught this really fine Rainbow on a Chuck’s Chunk streamer. Both anglers worked really hard on a very hot day but everyone had a great time. Greers Ferry Lake is in great shape and we should have some great river conditions for the fall fishing. There has been very little Hybrid activity on the lake of late but that too will change very soon. 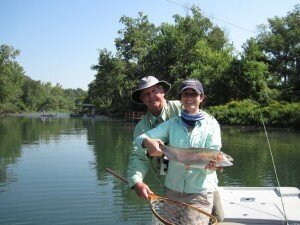 John and Christina plan to be back to fish with us this fall and we would love to have you join us as well.